The investigation revealed the passenger car was traveling east bound on Wright Street in front of a Checker bus occupied by the driver and 37 Northstar Academy students. The bus rear ended the car, which had stopped at the pedestrian crosswalk at that location. Injuries were reported by two students’, but no students sought treatment at that time. The cart hat was rear ended was occupied by three Ishpeming teens who were transported to UPHS for non-life threatening injuries. The bus driver, 46 year old Marquette resident JoAnn Carlisle, was found at fault and cited for Failure to Stop with Assured Clear Distance. 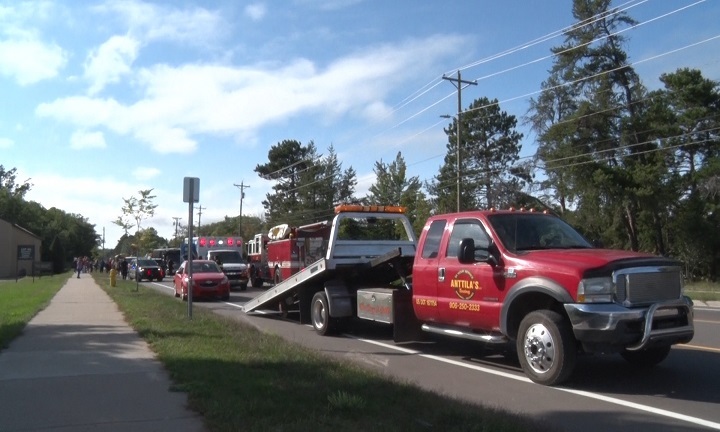 Marquette City Police were assisted by the Marquette County Sheriff Department, UPHS Ambulance Service and the Marquette City Fire department. MARQUETTE — There was a report of a two vehicle accident involving a school bus and a red car. The accident was reported at approximately 4:00 pm along Wright Street near the round–about and McClellan Avenue. The bus had sustained damage to its front while the rear of the red car was heavily damaged. The accident was quickly assessed by local officials and the students on the bus were safely taken out of the scene and assessed for injuries. The students were then transported to a new vehicle by Marquette Police after being checked out by medical personnel and cleared to be taken home. We will update this story as information is provided by local officials.